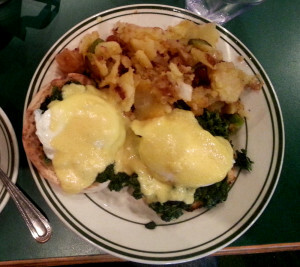 A classic breakfast at a local eatery is among the simple yet cherished pleasures in the Western World, and easy eggs at Brooklyn’s Park Cafe is certainly one of mine. While I enjoy the fancier brunch locations, there is something particularly pleasurable about the basics. 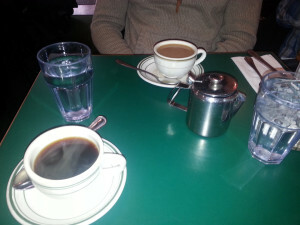 And this weekend, my choice to seek out the basic American breakfast proved more entertaining than normal, as I found myself back at the Park Cafe, at 82 7th Avenue, between Union Street and Berkley Place, near Grand Army Plaza. You can find their page of Yelp reviews HERE. This establishment has been serving Brooklyn’s Park Slope neighborhood for more than 30 years. There, I once again enjoyed a thoroughly satisfying American breakfast of crisp smoked bacon, home fries and a pair of over easy eggs, or “over lightly” as they tend to be called around here. As much I enjoyed the good eats, it was my timing that provided the entertainment. Without a table to be had, and with larger groups pondering the choice of waiting or going elsewhere, I sat down as the lone customer at the counter in the back. From that position, I had an intimate view of the staff at the peak hour of 12 Noon. I was simply astounded by the chief waiter. As the late morning rush collided with the impatience of customers who waited until early afternoon to break their fast, this young man attained speeds of digital dexterity and rapid fire articulation beyond what I thought possible outside of a movie where they speed things up for comic effect. And this went on for an extended period of time, as he went faster, and faster, and faster, trying to insure every detail was accounted for. No klutzy character, this particular professional elevated the game of all those around him, calling out for the large tomato juice seconds after failing to get a response from his support people the first time around, as he scribbled things on a green pad, while waiting for the toaster, since he had a scant few moments at the counter before rushing off to get more orders. And still he found time to help the even-younger waiter locate the more obscure items on the menu so the kid could complete someone’s bill of sale. “Have you been helped, Sir?” He asked me, as if it was a point of genuine pain, should my answer be in the negative. I said that I had not, quickly adding that I was in no hurry, but knew what I wanted. The even-younger man assured him I would be taken care of, despite all the delivery orders arriving by fax and phone, with every table in the place full of expectant mouths to feed. So, the veteran spun around to collect hot plates from those behind the dressing station wall, where he promptly returned one, to their general surprise. And so they ended up back on the griddle, which was in plain view from my seat. There, the short order cook placed them among his many other charges. Now here is a master at his profession. This slender youngster in the phat ball cap, featuring a Yankees NY logo, but with the crown in Knicks orange set off by a blue bill, moved his long, thin metal spatula with the precision of a surgeon. As the orders mounted, being shouted around the corner, often in a list of three, or four, or six separate meals, the cook seemed oblivious, as he kept right on flipping, sliding, slicing and dicing. The tickets were hung along the dressing station at his back, so he could refer to them as needed. But I never saw him look at a single one. At times the flat silvery griddle was festooned with pancakes, and omelets, and cured meats, and bricks of what I assumed where slivered hash browns, as opposed to their normal chunky home fries. The waiter would return with more orders, and vocally prod him for things still on the griddle, and yet the cook remained steadfast, unflustered, but in constant motion, as he scrubbed sections of the steaming surface with steel wool and water, prior to covering each spot with some new portion of an awaited breakfast. When I saw two plain eggs placed side by side, front and center, I had a feeling they were mine. When he turned them over, I started counting. Far too often in this city I have ordered my eggs too late in the day and found them totally overcooked. Although I must say, that was never in this place of brisk breakfast business, before now. I watched my eggs sizzling away, as he began someone’s omelet, then scooped up another finished omelet, which was dressed on one of two different plates with their obligatory potatoes and extras, and then he whisked them to the dressing station, before filling the empty space with some new order. At exactly the thirty-second mark, he scooped my eggs from the griddle, slid on my portion of potatoes before laying the crispy bacon over top, and handed them to those unseen behind the dressing station wall, who promptly placed them under the warming lights. He was faster than expected, so I waited happily for my toast before I was brought my plate. The eggs were perfect. My request for orange marmalade was met instantly. My coffee cup refilled, just as I began to refill me. The proprietor was stationed at the coffee maker, just on the other side of the counter from my privileged point of perspective. Slightly hunched with the resignation of one who knows from experience that there is no influencing Father Time, the slender man of medium height with barely a touch of gray in his black hair and matching mustache, was occasionally shaking the metal dispenser none the less, to hurry the output, as 10-cup pots were depleted moments after they were filled. He shrugged his shoulders, and sighed as he shook his head at the waiters flying around him, nearly frantic in their efforts to stay afloat on the latest wave of customer demands. He knows; nobody’s gonna die if they don’t get their eggs before they wish. They come back anyway. They always do. “A hundred pots, on Saturday and Sunday. So, that is… What? A thousand cups a day?” He answered me with a voice that suggested mild fatigue and remnants of a Greek accent. And yet, he always finds time to engage the smallest children among his clientele. It is something he has never grown tired of in all those years. Taking genuine delight in their antics, he teases them wryly, while keeping his jokes well within their sphere of comprehension, and leaves them with a sense of being appreciated for their expert opinion on Raisin Bran, or the French toast, which comes in the normal white bread variety, or made with Jewish challah bread. No one seemed to complain that the usual Cartoon Network had been replaced by the Olympic Games, on the two wide screen TVs set high up over the crowd. The Park Cafe is not a Grecian diner, although the newest waiter slipped into Greek when seeking clarification from more experienced colleagues. He was always answered in the same flowing tongue, tipped with k’s and p’s like white caps on a busy surf. None the less, this place is as Brooklynese as Bugs Bunny. While they do have the obligatory section of Greek dishes, centered on feta cheese and “gyro meat,” they have as many dishes that claim to be Italian, or Mexican. But really, the menu is decidedly American diner-style food, where even the Mexican named dishes like the Huevos Rancheros are Anglicized into their own unique yet enjoyable versions. And then there is the Sombrero, which has a foundation of corned beef hash. 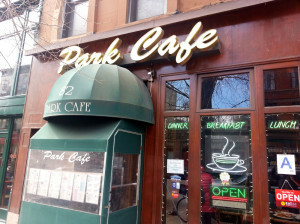 The Park Cafe is known for its “Sloppy breakfast,” a sort of bubble and squeak of meats and vegetables chopped to bits and mixed with eggs, before being entombed in a coating of thin, melted cheese. And there is the “Healthy Sloppy,” a version featuring turkey-based meats, along with broccoli and mushrooms rather than potatoes. For another thing, the Park Cafe it is not open 24 hours a day, which means it does not qualify for the traditional title of Diner within the five boroughs of New York City. So, cafe it is. But it is more American coffee shop than a cafe as Europeans might know the term. With some irony, the coffee is basic diner brew, sightly nutty with a tinge of burnt around the edges. But it is good enough that I tend to drink it black and on the weekends it is guaranteed to be fresh. But some of my coffee snob friends lament that this otherwise excellent breakfast nook has such average joe. What the Park Cafe is regaled for are the pancakes, among many other things. But the pancakes are far and away superior to all the other coffee shops and diners that fall within the original historic district of Park Slope, which is centered on 7th Avenue and runs from Flatbush Avenue to 9th Street. While one may find a snootier restaurant along 5th Avenue that has enjoyable pancakes, or perhaps on 7th Avenue, beyond the old 9th Street border, they will also pay considerably more for the privilege. Here, the pancakes are typical, nicely priced, and most importantly, good. Golden, of medium weight, they are satisfying from start to finish, without ever seeming like some nondescript hunk of dough, like those found in similar places. They are available as a regular stack or silver dollars, as well as wheat cakes. I wish they would offer a short stack, which could be easily matched to the usual bacon and eggs. But perhaps it is best they do not, since that keeps me from ordering them too often. But really, I tend to stick to the basic breakfast, and the Park Cafe is just far enough away from my dwelling to require a genuine choice on my part when seeking out my easy eggs. It is an effort I gladly make. The Park Cafe on 7th Avenue in Brooklyn offers fast friendly service, and food generally a step up from all other 7th Ave diner/cafe eateries in its class. The bacon comes crisp, and is of notably better quality than the competition. 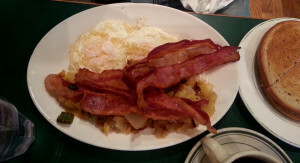 The home fries are a little salty, but they have just enough green pepper and onion mixed in, while other places either fall short in this respect, or over-do it. But a customer may order their bacon or eggs or potatoes cooked as they prefer, and odds are in their favor that they will get them just the way they like them. And for all those people who choose to go there, rather than other places, most of them rarely notice just how much effort goes on around them to make their experience as enjoyable as possible. While I was already aware of how busy the waiter is when I visit the Park Cafe, after this weekend I will be even more appreciative of just what he is dealing with when not focused on me and my needs. Everyone has their favorite breakfast spots. If you love Huevos Rancheros in Flagstaff, Arizona, it is MartAnne’s. If you are into the classic American fair in Southern Connecticut, it is Huxley’s Bookmark Cafe, in Meridian. Some of the grits and biscuits eateries across the South are national treasures, while the chili cheese omelets found along the beaches of Malibu hold a special place in my memory. The incredible edible egg is a true joy of existence. But having someone else fix them for you, in a way that leaves you immensely satisfied, elevates the experience enormously. Which would YOU recommend? One Man’s World would love to hear from you about your favorite place for breakfast, or brunch. Please, feel free to contribute your favorite breakfast nooks, and what you recommend there, by using the comments field below this post. I am sure travelers would be happy to have a list of the best breakfast spots around America. or for that matter, beyond the borders, as I know a few places where the British bacon is a highly coveted treat. I should like nothing better than to begin compiling that list right here. And as I was contemplating that very notion, it brought to mind a favorite monolog from the Sam Shepard play Cowboys #2, extolling the virtues of breakfast in all its variety. And then I thought of a favorite song, by a favorite band, Life in a Blender. I went looking for it on YouTube, to add some version or other at the end of this post. I find none have ever appeared there. So now, there is one. And it is posted here below, for your enjoyment. And that is one man’s word on Easy Eggs at the Park Cafe. And “Easy Eggs” happens to be the name of the song. Be sure to change the resolution to the highest-def your device can accommodate, for the best sound.